Are you ready to be a good girl? Amy Chua’s book, “Battle Hymn of the Tiger Mother”, is the story of one mother’s efforts to bring up her two children, Sophia and Lulu, using strict ‘Chinese parenting’ methods. Chua was raised by strict Chinese immigrant parents, and as an adult who was appreciative of this model, she taught her own daughters using what she calls this ‘diligent, disciplined, confidence-expanding Chinese way’, while living in America. Public response to the book has drawn anger, shock, upset, and even hatred. The other side can’t see what all the fuss is about – but this side is also surprisingly quiet on the matter. And both sides have been revelling in the polarity of the ‘permissive western parenting’ and ‘demanding Eastern parenting’ models, as if such a polarity is necessary to any parent-child relationship. Chua’s reasons for celebrating the ‘Chinese model’ are based on the fact that when she lapsed into non-achievement as a teenager, her parents were quick to whip her back into shape, using what she calls ‘tough language’, providing discipline which she responded to and is now grateful for, and thereby rendering her a success in life. Harshness is relative, and by traditional Chinese standards, Chua points out, her methods were often lenient, and later in life even became accommodating of her children’s own desires. Chua comes across as a ruthless character, but her determined resolve, while extreme to any westerner, is also something to be admired. Chua’s testament to the success of her chosen style of parenting is her daughter Sophia, who ‘would never have developed her love of music if it wasn’t for me’. Chua has decided that so long as her children do what she thinks is best for them, they cannot possibly have been failed – because what else is a parent’s role in a child’s life? As adults, they are free to do as they please, but as children, they must please the mother who birthed them. Such is the logic of the Tiger Mother, and although the criticism of it has been rife, reactionary and often downright rude, Chua is still a successful mother who remains committed to doing what she believes is best for her daughters. Indeed, the brash, frank honesty of her choices in “Battle Hymn” is something all mothers can admire – and cringe at. In the Opinion Pages of The New York Times, David Brooks writes that Chua is ‘protecting [her children] from the most intellectually demanding activities because she doesn’t understand what’s cognitively difficult and what isn’t’. Whilst I agree that our brains are capable of different kinds of intelligence, I don’t think it’s fair for Brooks to comment on this particular aspect of Chua’s parenting. Chua admits that ‘she worried about Sophia socially, because she spent every lunch and recess alone, wandering around the yard with a book’, but Chua is also entitled to value certain subjects and careers over others. What are parents if not teachers who, willingly or not, instil their values in their children? I am inclined to agree with her that neglecting to encourage one’s children to do anything at all is a parenting method more worthy of criticism (though an acceptable western parenting standard, perhaps). Various columnists have missed the amusing nature of “Battle Hymn of the Tiger Mother”, for example when Chua admits that she thinks ‘playing drums…leads to drugs’, and that parenting Lulu was like ‘trying to tame a feral horse’. There is more humour than harm here, and in Chua’s opinion, her daughters may hate her for her regime, but the end – their success- justifies the means. There is no doubt that Chua uses weapons and tactics of every kind of manipulation, and she is the first to admit this. There is ‘no rest for the Tiger Mother’, she says though the media has read this statement as ‘no rest for the wicked’, instead. This latter view has swept across America, the UK, parenting communities, book groups, and so on, but to look beyond that, what this book really reveals to us westerners is the drastic culture gap between ourselves and Asian culture. Critics of Chua are quick to recite that suicide is the number one cause of death among young people in China, but this is not solely due to the pressures of life for children in China: Chinese children also have high expectations of themselves, and a sense of pride that we do not harbour in the west. Critics point out that Chua devalues art and drama whilst celebrating Shakespeare, as if this apparent hole in her logic proves that she is a bad mother, but other cultures often value rigid learning, maths, and science over art. Hence when Chua interviews a music teacher called Richard who ‘said there were no rules in music, only what felt right’, her conclusion is: ‘Poor guy—I guess he just didn’t have what it took’. If Chua had been Mozart’s mother, he may never have become the classical composer we know him as today, but he still might have benefited from guidance and coaching from an enthusiastic mother. There are currently research programs in China dedicated to discovering the supposed ‘model’ that allows Americans to come up with new ideas and excel in creating new art. This is, perhaps, how a naturally ‘rigid’ culture approaches creativity. Would Chua’s daughters likewise approach attempts at originality, creative flair and fresh thinking with such a design; robot-like, as if a computer model can really be applied to original thinking? We see from Lulu’s rebellion in the book that her outspokenness and determination at carving her own path, and her creative zeal, are not diminished by Chua’s parenting methods. In CNN World, Anne-Marie Slaughter writes: ‘Innovation requires creativity; entrepreneurship requires a willingness to break the rules’, but again this type of reasoning represents a very western way of presenting a dichotomy as the answer to a question – with an ideal on either end – when in fact neither choice is ideal. 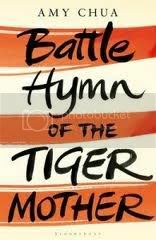 The greatest irony of Battle Hymn is that Chua writes: ‘There are all these new books out there portraying Asian mothers as scheming, callous, overdriven people indifferent to their kids’ true interests’, but unfortunately for her, this is how her book has been interpreted too. Critics would gain much from putting aside their angry feelings towards Chua and approaching Battle Hymn as a worthy study of two very different cultures, and one woman’s attempt to reconcile them. The ‘virtuous circle’ Chua talks about says a lot about Chinese parenting methods, and the lack of any such rigidity in western parenting, while eager to condemn another mother’s attempt, says a lot about both worlds. Many have argued, and will continue to argue, that Chua has missed ‘the point’ of parenting; of motherhood; of life. But I would argue that so have many of those who have read and reacted to this book. Zion Lights blogs at http://mammasforvictory.blogspot.com/. Thanks for posting this, Alison. Good balanced review – I have heard good and bad things about this book (and its author).